Oceana Hamilton attempts a layup. The senior center finished with 5 points in the loss to Nebraska. In a tight back-and-forth battle, Nebraska outdueled Northwestern to pull out a 69-59 victory Sunday. The Cornhuskers jumped out to an early double-digit lead, but the Wildcats (8-10, 1-3 Big Ten) battled back in the second and third quarters to take the lead at times. But after that, the visitors opened the final period on a 10-0 run to take a 63-49 lead and pull ahead for good. The Wildcats have now hosted two conferences games and lost both, previously falling 90-63 to Minnesota on December 28. Once again, NU struggled defensively, allowing the Cornhuskers (11-5, 2-1) to shoot 55 percent from the field and 47 percent from 3-point range. That offensive effort was spearheaded by guards Taylor Kissinger and Hannah Whitish, who combined for 30 points on 10-of-19 shooting. 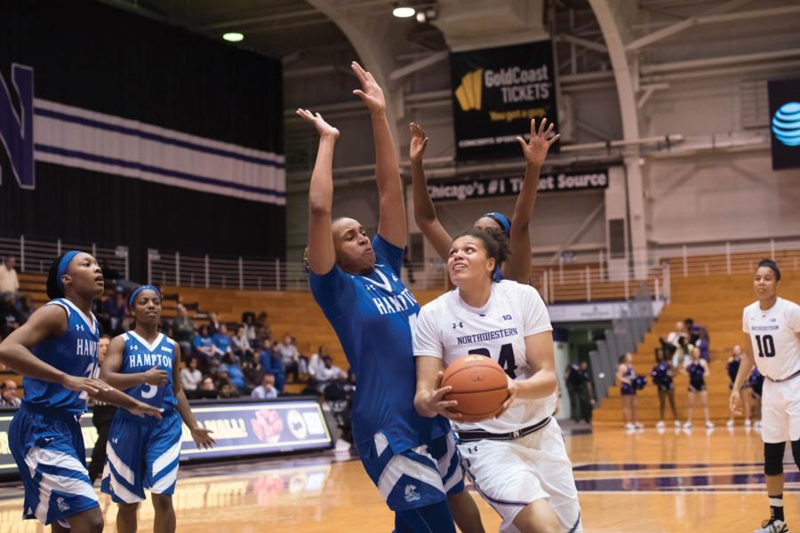 NU’s offense was led by its freshman guards, Lindsey Pulliam and Jordan Hamilton, who each scored 15 points. While Pulliam shot 6-for-18 from the field, her backcourt mate was much more efficient, making five of her 11 field goal attempts and finish 4-for-5 at the foul line. Overall, however, the Cats had a tough time on the offensive end, shooting only 34 percent from the field. NU hung around despite such bad shooting because of its ability to get to the foul line, where the Cats went 17-for-22. They also took relatively good care of the ball. NU averaged over 17 turnovers per game before hosting the Cornhuskers, but only committed 11 Sunday. Junior forward Pallas Kunaiyi-Akpanah also contributed on both ends, putting up 11 points, grabbing 16 rebounds and blocking three shots. At 1-3, the Cats sit in the bottom half of the Big Ten through four games and may be looking at a spot in the bottom four in the conference and an appearance on day one of the Big Ten Tournament.